National Day Bonanza. Flat discounts! Exciting offers! Don't miss out on Centrepoint 5 day Bonanza from 28th of Nov until 2nd Dec! 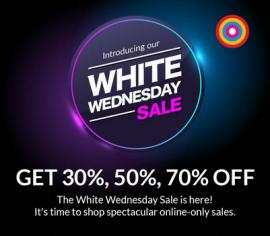 Centrepoint - White Wednesday Sale. Get 30%, 50%, 70% off. It's time to shop spectacular online-only sales. Centrepoint Weekend Bonanza. 1st November - 4th November. 25% Off on almost everything! T&C apply. Centrepoint - Shopathon: 30%, 50%, 70% off. Online Exclusive. October 26, 27, 28, 29. 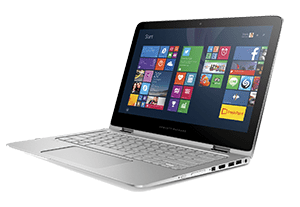 Get 30%, 50%, 70% off on over 36,000 products. Clothing! Home decor! Kids' gear! And much more. Centrepoint - Part Sale. From 25% to 60% off. Now enjoy Further reductions on all your favorite pieces! Visit us in-store for part sale on selected items. 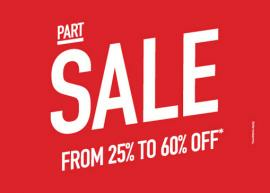 Centrepoint - Part SALE from 25% to 60% off*. Conditions apply. 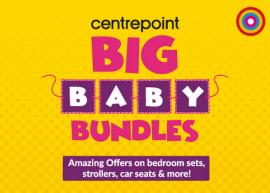 Centrepoint Big Baby Bundles. Amazing offers on bedroom sets strollers, cars seats & more! Offer is valid from the 26th March - 1st April, 2017. 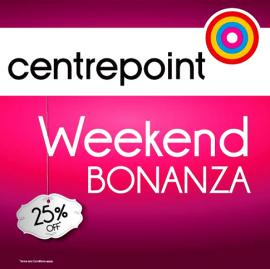 Centrepoint - Weekend Bonanza, 25% off. Offer valid from 28th February to 4th March 2017. Centrepoint - Enjoy DSF sale in Dubai and special offers in other Emirates in Centrepoint stores. Centrepoint represents the Landmark Group's strategy to synergize its core retail concepts, Babyshop, Splash, Shoe Mart, and Lifestyle, under one identity, thereby projecting a 'single fashion destination for the entire family'. Get all information about Centrepoint offers in Dubai, Centrepoint offers in Abu Dhabi, Centrepoint Dubai sale, Centrepoint stores in UAE, Dubai Shopping Mall offers, fashion & clothing sale, women's & kids' fashion, men's fashion offers, baby essentials, makeup, shoes & home décor offers, deals on apparel and Centrepoint latest offers in UAE by browsing through TomatoSALE.